1. Your New novel ‘Blue Eyes’ is launching soon, how are you feeling right now? Happy, excited and butterflies in my stomach. I was always writing. Even as a child I used to write down my feelings, imaginations and anything that caught my attention, turning them into stories or poems. I never consciously thought ‘I want to be a writer.’ Whenever I feel inspired, I can’t help but write. 3. How long does it take you to write the novel? My first novel took me three years to write. Without any pressure and having all the luxury of time I wrote it leisurely, as a hobby. 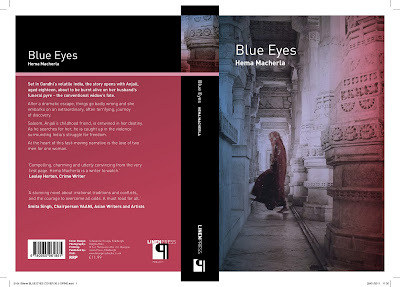 But I wrote my second novel, Blue Eyes, in less than a year. Before I published I just wrote whenever I felt in the mood, or inspired. But now I set myself a time table and try to stick to it. Usually, a few hours first thing in the morning and then late afternoon but mostly I end up writing at nights. I am more focussed in the quietness of the night. 5. When did you write your first work and how old were you? I wrote my first short story when I was twelve for a school magazine, but published one at the age of 24 a few years after I came to England. 7. What does your family think of your writing? They are proud of me. They think I should believe more in myself and my writing. I suppose they are more appropriate to answer this, but they highly value what I have accomplished. 8. What was one of the most surprising things you learned in creating your book? That language is no barrier for creative writing. When I am writing sometimes it surprises me that the characters won’t listen to me and write their own story. They become real people and they have their own minds. 9. How many books have you written? Which is your favourite? I have written two books. Both are equally my favourite. It is like asking a mother which child she likes the most. Of course they are two completely different stories. 10. Do you have any suggestions to help me become a better writer? If so, what are they? Smita, if it is for you, I know you are a good writer already and I don’t need to tell you anything. But for beginners it is essential to read as much as they can. Write, write and write regularly. Take criticism, particularly the negative ones and use them as building blocks. 11. What do you think makes a good novel? You start off thinking that you will only read one chapter but then end up reading it the whole night without putting it down. 12. What inspired you to write ‘Blue Eyes’? While reading ‘The life of Mahatma Gandhi’, a little story my great grandmother told me when I was a child, came to my mind and the thoughts formed and the idea was conceived. 13. How would you describe ‘Blue Eyes’ to someone who has not read any of your previous books? It is set in 1920’s India, when Gandhi was just entering the political stage, and how the young people caught between the ideals of Gandhi and the British colonialism. 14. Does story writing come easy to you? What other things do you write? Do you have a specific writing style? Yes, story writing is much easier for me than any other writing. I used to write short stories and articles for weekly magazines. I suppose I have my own style of writing and readers are the better placed to say what it is. I think every writer has her/his own unique, original style of writing, like their voice, their thinking. The most important thing is that it should come naturally. 15. How did you come up with the title? I didn’t think much about the title. While writing I needed a name to save the file in the computer and I just typed Blue Eyes and later it sounded appropriate. 16. What was the hardest part of writing your book? It needed a good deal of research and I found that part particularly difficult because the information from different sources varied so much. 17. Is there a message in your book that you want readers to grasp? I don’t want to say I am giving any message as such but the readers can grasp their own message from it. I hope that one can realise that how an Indian woman was treated for centuries on end and how she transformed herself now from that sort of background. 18. Your book has emotional conflicts and old traditions and new rebellion, has that got something to do with your own life experiences? It is nothing to do with my own life experiences, but with someone, who is very close to me who has endured so much. 19. What are your current projects after ‘Blue Eyes? I am thinking of writing another book and I have a couple of ideas but not decided yet on which one. 20. Name one entity that you feel supported you i.e. family members/friends. My entire family and friends supported me through out, but if I have to pick one I can say it is my husband. 21. Can you share a little of your current work with us? I haven’t started it yet. 22. Is there anything you find particularly challenging in your writing? Yes, grammar. When I started my first book, writing in English itself was a challenge for me. I haven’t learned the language meticulously with grammar at school. I only learned it by reading books. It is getting a little easier now but still I always have to check my grammar. 23. Give us three "Good to Know" facts about you. Be creative. Tell us about your first job, the inspiration for your writing, any fun details that would enliven your page. Officially I can say my first job was working in an optical company, where my heart just wasn’t in the work. The inspiration for being creative came from my mother. As a child I used to watch her burning the midnight oil to write. I literally mean oil, because we didn’t have electricity in my village, Atmakur until 1973. After finishing her house work and her children securely in bed, my mother would sit with a kerosene lamp to write her book. Sadly her book didn’t get published but fortunately her zeal rubbed off on me. She used to encourage me to participate in school essay writing competitions etc. And I even managed to bag a few prizes. Later my husband Radhamanohar encouraged me and supported me to write. Fortunately many of my stories, which I wrote from 1980-1990 were published in various Indian weeklies and monthlies. Also, I get the inspiration from human life that moves me or touches my heart. When I first came to this country I couldn’t speak a word of English. At that time my husband used to work as a junior doctor and just after a week of my arrival in this country I answered a phone call, because my husband was in the bathroom. The person on the other end asked if my husband was at home. I said, ‘yes’. Then she asked me if she could speak to him. I said, ‘No’. She said, but it is urgent. I said ‘fine.’ The conversation went on like that for some time. The thing was I couldn’t understand a word she was saying. I was just repeating those three words and in the end I said thank you. She got frustrated and put the phone down. The reason I kept repeating those four words were because before I came to this country I was worrying that I couldn’t speak any English and someone in my family said, ‘Just say yes, no, fine, thank you, and you will be fine. Anyway afterwards I told my husband about the phone call and you should see his face; he was so embarrassed. That evening he came home clutching a woman’s magazine. Even with a dictionary on my side I couldn’t understand a single sentence so I went to the library the next morning and borrowed children’s books. That is how I started learning English. Since then reading became my favourite hobby and now writing. 24. What else do you want your readers to know? Consider here your likes and dislikes, your interests and hobbies, your favourite ways to unwind — whatever comes to mind. I love reading the classics as well as modern literature. Besides writing I love painting, listening to A R Rahman’s music, old Telugu songs, watching old films. My favourite way to unwind is a cup of tea and malted milk biscuits with a good book on a cold winter day and also playing with colours on a canvas (even though I am not good at it) is very relaxing. A walk in the woods, (preferably Lake District) in summer would be very nice.